Henry Ford’s famous “tax turn” made sure the B-24 bombers were built—and delivered—in Washtenaw County. There are many rumors around town about why Ford’s Willow Run WWII B-24 assembly line takes a 90-degree turn at the end, enabling the finished bombers to exit the plant on the Washtenaw side of the county line… but here’s the real story! A look at the map reveals that the old bomber plant lies snug up against the Washtenaw/Wayne county line, west of Detroit, near the town of Ypsilanti. There’s got to be a story there, right? Well, there is. The Willow Run Bomber Plant was conceived of in 1940, and, for the most part, built in 1941 prior to Pearl Harbor, in expectation of war. Henry Ford already owned most of the 3,000 acres of farmland, straddling the two counties, that would soon comprise the colossal plant with its mile-long assembly line, adjacent Willow Run Airport, and a US Army Air Force base. As planning for the complex proceeded, Ford wanted Wayne County to build a freeway all the way out to Willow Run, in order to get his 42,000 workers to and from the plant (I’m going to assume here that talk of a freeway was already on the table, and Ford wanted it extended a bit to service his planned plant.) Since he sat on the Wayne County Board of Commissioners, he figured he could accomplish this. Well, Ford could not get either of the other two members of the Wayne County Board to vote with him in favor of the freeway extension. So in retaliation, when laying out the Willow Run Complex, he placed the revenue-generating factory on the Washtenaw side of the line, and the non-revenue-generating airport on the Wayne side. 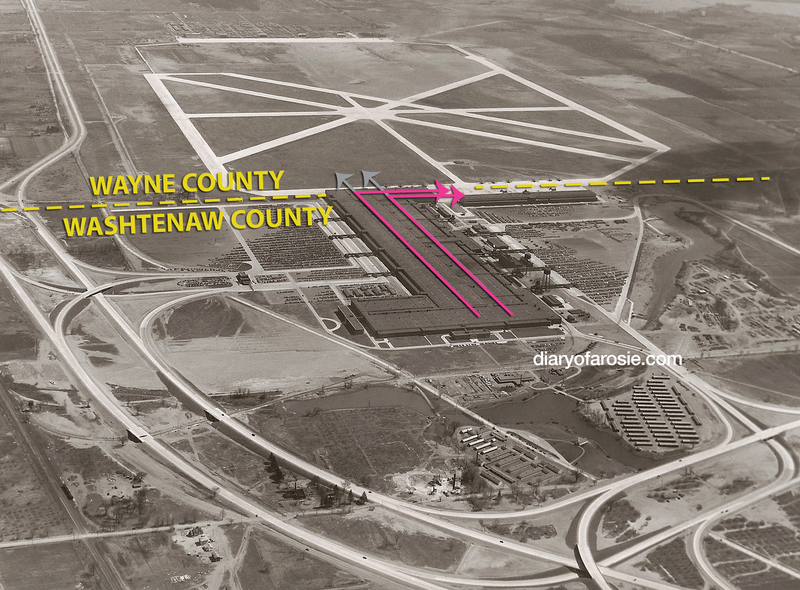 The assembly line was to run right up to the border, with the planes exiting the plant in Wayne county. But since they were built in Washtenaw, Washtenaw would get the tax revenue. This layout was really quite an “FU” to Wayne County. Not to be outdone, Wayne County then passed a law that placed a $2 tax on any aircraft that was “delivered” in Wayne County. If this gambit had been effective, Ford would have ended up paying an extra $17,370 to Wayne County in taxes over the course of WWII. So Ford redesigned the plant, and, at considerable cost, put 2 giant turntables in the factory’s floor that rotated the bombers 90 degrees as they were being completed. That allowed him to place the giant bay doors through which the completed bombers exited, and the tarmac they rolled out on, firmly in Washtenaw County. So Ford had the last laugh, at the expense of Wayne County, but it cost him $300,000 to do it! I heard this story with a group of people at Willow Run Airport, told by Sean Brosnan of the Wayne County Airport Authority.